From above, the city is knots of green punctured by blue, red and beige roofs rolling into a strip of bright white sand before falling into the sea. In August, the air in the city is cool and a crisp ocean breeze clears the humidity. What better setting for a book fair? Actually there are any number of better settings, because behind that façade of tranquility and summer sunshine lies the harsh reality of Somalia, a land and its people torn apart by violence and strife. This is Mogadishu, which last week held its fourth annual book fair in defiance of the chaos happening all around. I’d wanted to offer more coverage of the Mogadishu Book Fair then I’ve been able to, but I’m thousands of miles away on the other side of Africa, and for all the wonders of the internet, and especially twitter, that let me follow the fair at a distance, there was little of substance written in English, and it seems the Google and Microsoft translation machines have yet to get around to the languages of Somalia. But I will share here this beautiful image from the Mogadishu Book Fair, which for me epitomises the spirit of hope which has kept the Mogadishu Book Fair happening these past four years in spite of all the obstacles and risks. At which point I hand over to someone who was actually there, and who has written up their experience for Al-Jazeera. Nanjala Nyabola spent a week in Mogadishu, and what follows, like the opening paragraph, are selected excerpts from the Al-Jazeera post. 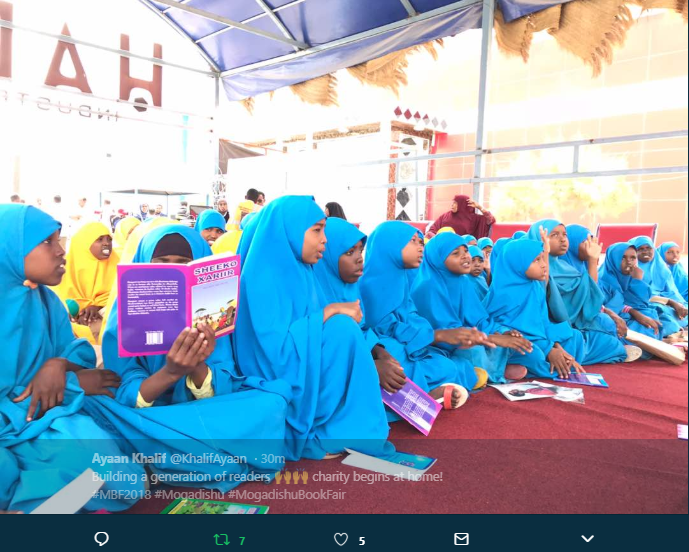 I do recommend reading the full post to fully comprehend the achievement that was the Fourth Mogadishu Book Fair, and to remind ourselves how lucky we are to live in lands where (okay, not me here in The Gambia, but for most reading this) books, bookstores, ebook stores and book fairs and festivals are something we can take for granted. …Yet in several important ways, Mogadishu is the same as any other place: filled with people who just want to get on with the business of being alive. The young people at the book fair are so excited to be surrounded by literature – especially in their own language. They are grateful for the handful of outsiders who confront fear to come and speak to them as people rather than subjects of study. And while it is impossible to escape the reality of conflict and insecurity, the large hall packed to the rafters with over a thousand pairs of eager eyes and happy smiles, is a testament to how welcome this event is. …The Mogadishu Book Fair is also a reminder that life persists. War is upheaval and uncertainty but life persists because people often don’t have a choice: all human beings suffer from that instinct to keep moving. Despite the perennial threat of random violence, people in Mogadishu still wake up every morning, get dressed and go about their business, because life persists. …Nevertheless, in Mogadishu, the reality of war is never so far away that those attending the book fair can forget it altogether. At eye-level, far below the range of drone photography, the trees are hidden from the street by thick concrete blast walls. Cars weave through security barriers along pavements patrolled by men in uniform brandishing automatic rifles … A five-minute walk elsewhere is a 30-minute security effort in Mogadishu. There are body scanners at every turn, invasive pat-downs to enter restaurants and coffee shops, and the constant background hum of military helicopters and regular shooting drills. …War is real, present and toxic, but hope and determination are a start to pushing back. The book fair and the cluster of efforts by young Somali people to reclaim the story of their country are an unexpected and welcome knot of green in the desert of conflict. Read the full post at Al-Jazeera.